We want them to smile, to listen, to go the extra mile, to feel part of a family - Whatever it is we can find an effective solution to your business objective. Each professional role player has been picked for their previous experience with NHS trusts, financial, manufacturing, government, retail, IT, education and a whole host of other markets. By creating a range of dramatic interventions we can guarantee to hit the target every time. Drama touches all of us: a play, a movie, a soap opera can affect people in unexpected ways - raising awareness, teaching new skills, holding up a mirror. People respond to drama in a way that bypasses too much thinking or analysis and gets right to the heart of the matter. The use of professional role-players and drama in business is neither fanciful nor irrelevant. Dramatically Different is not about performance; it's about presenting engaging scenarios to groups of people which demonstrate and highlight some of the crucial problems facing them on a day to day basis. Home truths hit the mark without making people wrong or putting them on the spot. Working with those groups, creative, unexpected and viable solutions are achieved. Issues addressed through this exciting medium cover just about everything! Everything that involves the effective use of communication between your people to get the job done. If it concerns people communicating with other people, we've done it. 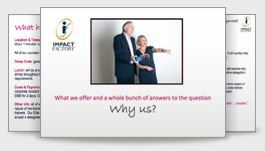 Impact Factory has been using Dramatically Different programmes with a number of its clients over the years including NHS, BASF, Deloitte and Touche, GlaxoSmithKline, General Social Care Council, Corus Group, Mittal Steel and Kellogg's among many others. Dramatically DIfferent works in a variety of ways to fit specific issues, group size, budgets and deadlines. What's consistent and common with every solution is raising confidence, interactive involvement, laughter, energy, enthusiasm, moving things forward, staff engagement. To find out more call us on +44 (0)20 7226 1877 and talk to us about how we can help your organisation through drama based solutions.